I don’t know about you but when I workout I am guilty of hammering the cardio and sometimes forgetting about strength…. which is not good! Strength exercises obviously build up your muscles and it is a fact that the more muscle you have the more fat your body will burn during the day! Now you don’t have to hammer the weights to get your strength workout in, in fact you can stay completely still and still work your body hard. 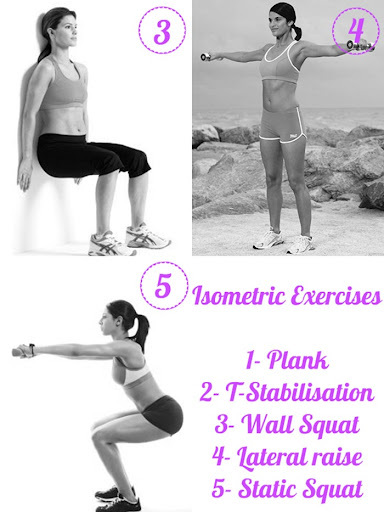 Above is a range of isometric exercises that slim you down and tone you up without moving a muscle! Isometric exercises require you to remain static and use your body’s own resistance and weight to challenge your muscles. So all you have to do is hold each of the positions for 60 seconds, three to four times, will a 30 seconds rest between each. 1- Plank- Lie face down on the floor and prop yourself up on your forearms and toes. Keep your bum down and your body in a straight line. Concentrate on your abs and glutes and squeeze them as tightly as you can and hold still. 2- T-Stabilisation- Firstly get into a push-up position. Next shift your weight onto you left hand and rotate your chest to the right as the raise your right arm towards the ceiling. Keep your feet stacked. Hold for a few seconds, then try it on the other side. That’s one rep! 3- Wall Squat- Stand with your feet should width apart and back against a wall. Lower your body, slowly down the wall, until you knees are at a 90 degree angle. Push into your heels and hold still. 4- Lateral Raise- Start in a standing position with your feet shoulder width apart with your arms at your sides and a 1kg to 2.5kg dumbbell (if you have no dumbbells, use a tin of beans). Slowly raise your arms until they are in line with your shoulders and hold them there! 5- Static Squat- Start in a standing position with your feet shoulder width apart or slightly wider. Extend your hands out in front of you to keep your balance. Sit back and down like you are sitting on an imaginary chair. Keep your head facing forward as your upper body bends forward a bit. Lower down so that your form a 90 degree angle with your knees and hips, ensuring that your knees never go over your toes. Press back into your heels and hold still. Have you tried isometric exercises before? Or do you prefer to use weights? Which one of this moves is your favourite? Oh god, I have been trying planking this week! (I'm a total fitness n00b and never exercise) but it's so hard!!! I've been holding it in 20second intervals. I thought it's better than nothing when watching the TV!